Dunbar-Ortiz is author or editor of seven books, including An Indigenous Peoples’ History of the United States. She will be in New York City beginning Wednesday. 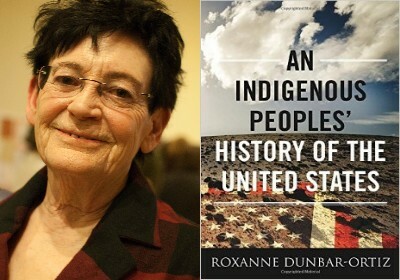 In the conclusion of her book, Dunbar-Ortiz writes: “The conventional narrative of U.S. history routinely segregates the ‘Indian Wars’ as a sub-specialization within the dubious category ‘the West.’ But, the architecture of U.S. world dominance was designed and tested by the period of continental U.S. militarism, 1790-1890, the Indian Wars. The opening of the twenty-first century saw a new, even more brazen form of U.S. militarism and imperialism explode on the world followed by two major military invasions and hundreds of small wars employing U.S. Special Forces around the globe, establishing a template that continued after their political power waned. “One highly regarded military analyst stepped forward to make the connections between the ‘Indian Wars’ and what he considered the country’s bright imperialist past and future. Robert D. Kaplan, in his 2005 book Imperial Grunts, presented several case studies that he considered highly successful operations: Yemen, Colombia, Mongolia, and the Philippines, in addition to ongoing complex projects in the Horn of Africa, Afghanistan, and Iraq. While U.S. citizens and many of their elected representatives called for ending the U.S. military interventions they knew about — including Iraq and Afghanistan — Kaplan hailed protracted counterinsurgencies in Africa, Asia, the Middle East, Latin America, and the Pacific. He presented a guide for the U.S. controlling those areas of the world based on its having achieved continental dominance in North America by means of counterinsurgency and employing total and unlimited war….